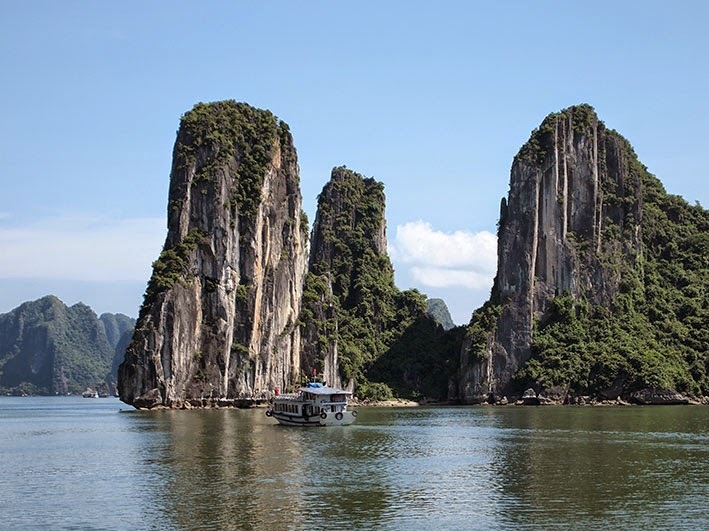 Due to a slight problem with my travel agent’s instructions, the bus left the hotel half an hour late at 09.00 for the four-hour drive to Ha Long Bay. The tour guide was grumpy, but soon got over it. On the journey, we stopped at a fine example of a tourist trap with carvings, lacquer ware, jewellery and clothing; there was also artwork created by rows of children sewing pictures of local scenes and Picasso's Guernica. In the harbour, our junk was one of many that chugged out to sea in a steady procession. As soon as we had taken our seats for lunch, the staff brought dishes of battered chunks of chicken, whole fish, deep-fried rice noodles with a mystery filling, sticky rice, vegetables and even a plate of slightly soggy chips. 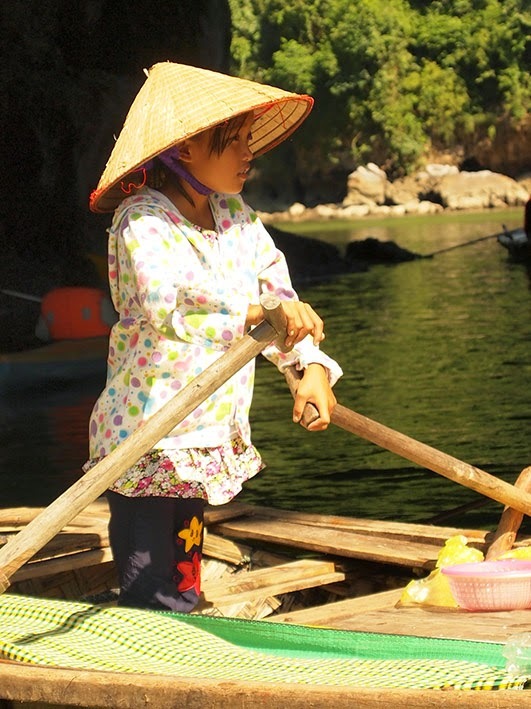 After leisurely chugging through the islands, we arrived at platform where the boatman squeezed the bow into a small space which fitted the boat nicely by the time it crunched forward towards the jetty. 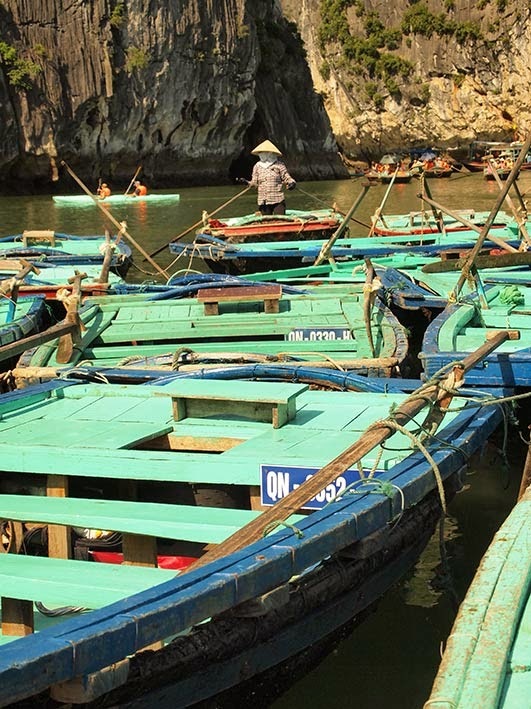 We clambered into small bamboo boats in groups of four and were rowed out to some of the islands by oarsmen who moved heavy western tourists with great skill. A log-jam developed at the entrance to an open cave but, like the cars and bikes on Hanoi’s street, it somehow cleared without incident and we continued into the baking sun and intense humidity. 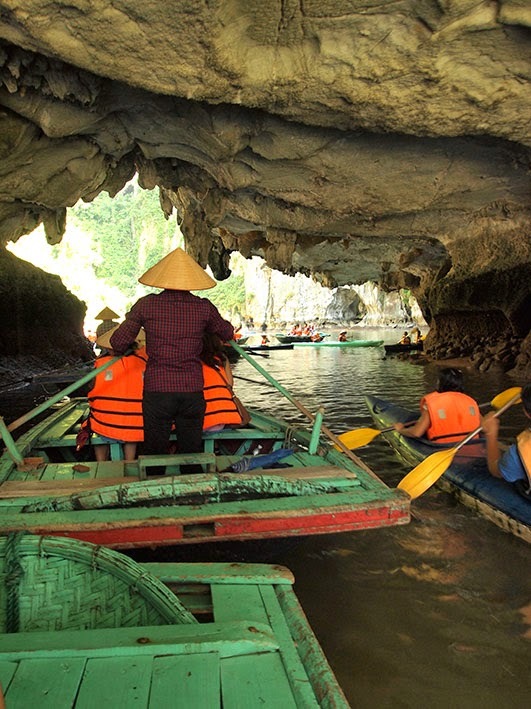 Back on the boat, we downed a few 333 beers on the way to the last stop on the tour at the Dau Go Cave. The humidity inside was outrageous, although it didn’t seem to bother two members of staff who sat motionless at a desk taking photos for tourists who wanted souvenirs, as if there weren’t enough cameras. Back on board the junk once again, we chugged back to the harbour and climbed onto a larger bus which had plenty of stretching-out space for the journey back to the capital. The bus could not drop everyone at their hotels as a few of the roads in the city are closed at night, however the first stop was in front of the Opera house which is adjacent to the Hilton Hotel.